Pushing the limits comes with its own limitations. You can only go so far! This is the latest in the list of challenges after a long smooth running CRM at our client's. I was reported that CRM wasn't saving any data as the Account and Opportunity forms data wasn't being saved. My first move was to check the Event viewer and I found this. Exception: System.ServiceModel.ServiceActivationException: The service '//XRMServices/2011/Organization.svc' cannot be activated due to an exception during compilation. The exception message is: Memory gates checking failed because the free memory (219115520 bytes) is less than 5% of total memory. As a result, the service will not be available for incoming requests. To resolve this, either reduce the load on the machine or adjust the value of minFreeMemoryPercentageToActivateService on the serviceHostingEnvironment config element.. ---> System.InsufficientMemoryException: Memory gates checking failed because the free memory (219115520 bytes) is less than 5% of total memory. Since the SQL Server and CRM Server are running on the same server, this wasn't a surprise. This pointed out something. 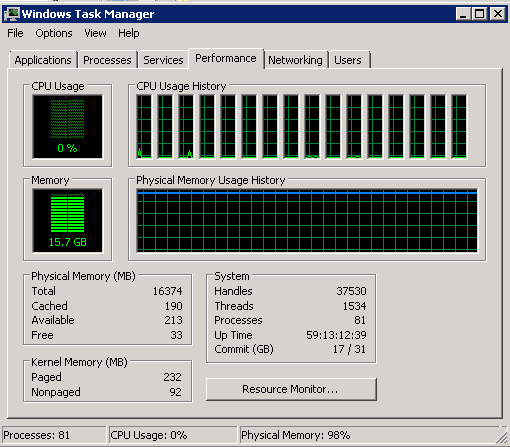 I immediately looked up the Performance Monitor on the Task Manager and sure enough, the RAM was almost fully utilized (screenshot below). To get around this issue, I restarted the SQL Server Services and CRM Async Services. Since no users were logged in at this time, the usage went down to 3 GB. This I believe is a temporary fix and it would return when we have users log in again. A permanent fix would be to separate the SQL Server and CRM Server and feed them with sufficient memory. Another resolution I have been reading online is to adjust the value of minFreeMemoryPercentageToActivateService on the serviceHostingEnvironment config element. I am wondering how would this impact otherwise.